ר’ דוד פרענקיל נולד בהוסיאטין לאביו ר’ יחזקאל ששימש ברבנות בהוסיאטין ובכמה קהלות יותר מארבעים שנים(מחבר ספרים דברי אברהם ביאור על הספר דעת קדושים להגה”ק מבאטשאטש, קונטרס השמות על שמות גיטין, ושו”ת אמרי יחזקאל, חוץ מזה היה לו שלשה כרכים בכ”י שנשרף כשהיה שריפה גדולה בעיר הוסיאטין בר”ח אב תרנ”ג), ולאמו מרת צפורה בת ר’ ברוך מנחם מענדיל אב”ד באכניע. הוא שימש כאבדק”ק הוסיאטין, ובלמחמת העולם הראשונה היגר לוויען. בהוסיאטין הוציא לאור ספרים רבים מכת”י ע”י חבורת ‘דובב שפתי ישנים’ שהבעל ‘אמרי אמת’ מגור, והרב ווילנער היו שותפים עמו, והיה רוכש כתבי ידות עתיקים (מוכרי הספרים שוואגר-פרנקל) שקטלוג בספר שהו”ל ‘אוצר כלי חמדה’ (רובם נמכרו אח”כ לבית המדרש לרבנים בנוא יארק (JTS)), וגם היה מוכר ספרים גדול , גם בוויען המשיך במפעלותיו, והוציא לאור ד’ פעמים בשנה ‘עלים לביבליוגראפיע וקורות ישראל’, ובו היה גם מופיע שמות הספרים שהיה אצלו למכירה, וגם שמות הספרים שיצאו לאור עולם ע”י מחברים שונים (ששלחו אליו עקזעמפלאר אחד). I couldn’t find when he came to America. He didn’t have a Rabbonis here. there’s also a השמטות to it at the beginning of the Sefer. my great grandfather zatzal in addition to being the av beth din in husiyatin taking over for his father harav yecheskel was invited by his brother in law rav lipa schwager ztl in 1906 to join the dovev sifsei yishonim then in lvov. it later moved to vienna around 1930.in 1932 rav lipa moved to eretz yisroel and horav dovid zatzal continued in vienna. they published major works including the tosfos rabbeinu elchonon on masechta avoda zara after being in manuscript for hundres of years (it was written by the son of the ri hazoken). my grandfather harav dov berisch zuckerman zatzal joined in 1931 after becoming his son in law.as a matter of fact he wrote an important kuntres on kodoshim at the end of the derech chaim of ravmenachem lunzano (who is Quoted in teshuvos rav akiva eiger).also other rishonim and acharonim with horav dovid zatzal’s notes .in 1938 he visited the united states for business with the library of congress and stayed in the united states when the war broke out. he was close with other great rabbonim in the united states including harav chaim heller, harav henkin and of course his mechutan harav yerucham leiner zecher tzadikim levrocha. my greatgrandfather horav dovid zatzal was the av beth din of husiyatin after his father horav yechezkel zatzal passed away in 1912. his brother in law rav lipa schvagger zatzal started the dovev sifsei yishonim in 1902 in Lvov .He invited horav Dovid to join in 1906.eventually .Rav Lipa moved to Eretz Yisroel in 1932 and Horav Dovid zatzal took over. In the early 1930″s he took into the publishing house his new son in law Horav Dov Berisch Zuckerman zatzal. The publishing house published many Rishonim for the first time from the original ksav yad e.g. the Tosefos Rabbeinu Elchonon on Masechta Avoda Zara which was an unpublished ksav yad for seven hundred years (as Horav Dovid writes in his introduction). He added on his footnotes and haoros and had great mesirus nefesh that they should be published in the nicest way. Around 1937_1938 he came to New York for the Dovev Sifsei Yishonim and when the war broke out he stayed in the United States.He lived in the lower East Side until his petira in 1948. He was close with many of the great rabbonim who lived in New York at that time. In addition to being a great talmid chochom and mezakeh horabim he was a neim halichos and was a great hotznea leches. He was also zocheh for a dor yeshorim mevorach with many children, grandchildren who are oisek in harbotzas torah,yiras shomayim and gemilus chasodim.Zechuso Yogen Oleinu. כמדומני שראיתי קבר באותתו חלקה מבן בשם ר’ יואל פרנקל האם כן? Rav Yoel, my great uncle was Harav Dovid zatzal”s second child after my grandmother Rebetzin Hinda Brocha Zuckerman zatzal. Incidentally he was named directly after the Bach zatzal whose name was of course Yoel since Horav dovid zatzal was a direct descendant of the Bach. after Rav Yoel zatzal the next child was rebetzin Dina who was married to Rav Naftoli Teichman ztl who had learned in Yeshivas chachmei lublin before coming to America before the war. Afterwards was the son Rav Lipa Frankel zatzal who was the son in law of Harav Yerucham Leiner ztl the Radziner Rebbe . Afterwards was Rav Yecheskel Frankel ztl who was the son in law of the Sokolisker Rebbe ztl. (He was named after the father of Harav Dovid zatzal who was the rov of Husiyatin until his petira in 1912). Ther was was another son Rav yosef in between Rav Lipa and Rav Yecheskel who was also a mizuyan and tragically was nifter in1931 at the age of 30. Harav Dovid wrote a special dedication to him in the begining of the Derech Chaim (of Rav Menachem Di Lunzano) which he published around the time of Rav Yosef”s petira. What is the name of the Sokolisker Rebbe mentioned above? Rabbi Zukerman was from a rabbinic backround? The son Reb Yoel was the SIL of? my grandfather rav zuckerman was the son of rav ahron zuckerman zatzal and was born in hivnev . his father was a businessman but a lso a talmid chochom. his grandfather was a moreh tzedek in hivnev . in his early youth till he was around 10 years old he learned in the local yeshiva and from his father and grandfather. later he was very mikoorav to rav meir arikzatzal the rav of tarnopol and learned by him for a few years as well as his brother rav boruch zatzal who later became a son in law of rav meir arik zatzal. he was also a talmid of rav horowitz the rav of stanislav. in the back of the bais ahron on horiyos there are letters from rav meir arik and rav horowitz.ztl. later when he moved to vienna besides working on the kisvei yad he had a daily chabura with a large group of talmidim many who became great rabbonim such as yblc rav vosner , yblc rav don ungarisher . unfortunately in 1938 when he had to run away from vienna this all ended. (p.s. in the last note inadvertently i made a small mistake ,the son rav yosef was born before rav lipa ztl). 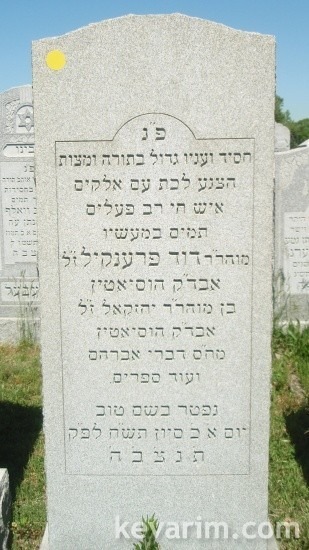 as far as who was rav yoel’s father in law im not sure although i know that it was a choshuva family from Dzikov . I did a little research about the name of the Sokolisker Rebbe(mechutan of Harav Dovid Frankel ztl). his name was Rav Halperin. He had a minyan or a shul on the lower east side somewhere near where the Streits matza bakery is (rivington,delancey etc.). It sounds like he has a relative by the same name who teaches at the shor yoshuv yeshiva in far rockaway.in any case he was a choshuva talmid chochom and yirei shomayim. So “Sokolivke” and “Sokoliske” are the same, and Rebbe Yisroel Arye Lieb Halprin is his name and he is listed on this site. Yes that is correct he is the same one. I am a great grandson of Rav Yoel Frankel and would be intrested to talk to you about the family history i was wondering if there was a way to contact people on this website personally but i haven’t found it yet. Is it possible to some how get me your phone number or email address and we could talk some how?